The elliptical galaxy Centaurus A (also known as NGC 5128) shown in deep field above is the closest giant galaxy to the Milky Way and is suspected to harbour as many as 2000 globular clusters. Many of these globulars are brighter and more massive than the 150 or so orbiting the Milky Way. An ESO team led by Matt Taylor have now made the most detailed studies so far of a sample of 125 globular star clusters around Centaurus A using the FLAMES instrument on ESO's Very Large Telescope at the Paranal Observatory in northern Chile. They used these observations to deduce the mass of the clusters and compare this result with how brightly each of the clusters shines. Up to now astronomers have studied star clusters to this detail only in the Local Group. The relatively small distances make direct measurements of their masses possible. 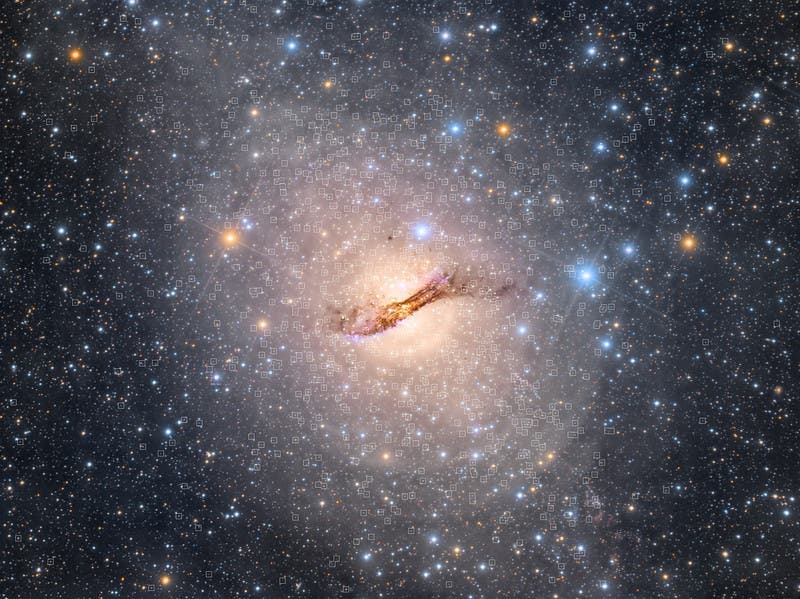 Looking at NGC 5128, which is an isolated, massive elliptical galaxy just outside the Local Group about 12 million light-years away, they were able to estimate masses of globular clusters in a completely different environment by pushing VLT/FLAMES to its limits. For most of the clusters in the new survey, the brighter ones had more mass in the way that was expected — if a cluster contains more stars it has greater total brightness and more total mass. But for some of the globulars something strange showed up: they were many times more massive than they looked. And even more strangely, the more massive these unusual clusters were, the greater the fraction of their material was dark. Something in these clusters was dark, hidden and massive. But what? There were several possibilities. Perhaps the dark clusters contain black holes, or other dark stellar remnants in their cores? This may be a factor that explains some of the hidden mass, but the team concludes that it cannot be the whole story. What about dark matter? Globular clusters are normally considered to be almost devoid of this mysterious substance, but perhaps, for some unknown reason, some clusters have retained significant dark matter clumps in their cores. This would explain the observations but does not fit into conventional theory. Co-author Thomas Puzia adds: "Our discovery of star clusters with unexpectedly high masses for the amount of stars they contain hints that there might be multiple families of globular clusters, with differing formation histories. Apparently some star clusters look like, walk like, and smell like run-of-the-mill globulars, but there may quite literally be more to them than meets the eye." These objects remain a mystery. The team is also engaged in a wider survey of other globular clusters in other galaxies and there are some intriguing hints that such dark clusters may also be found elsewhere. Matt Taylor sums up the situation: "We have stumbled on a new and mysterious class of star cluster! This shows that we still have much to learn about all aspects of globular cluster formation. It's an important result and we now need to find further examples of dark clusters around other galaxies." The Milky Way's Globular Star Clusters –"Relics from the Early Universe"